Interested in learning how to grow your YouTube audience from in 2019? Well, in this post, I will share with you 12 smart ways to market and promote your YouTube channel and get people flocking to subscribe. Let’s start with why? Why do you want to grow your tribe over on YouTube? I know what you’re thinking. Well, that’s a ridiculous question, Fabrizio, because you want more people to view and engage with your video content, right? Assuming you are creating content on YouTube. And if you have an online business, then leveraging the power of video and YouTube can do wonders for the growth of your business. Traffic! Yep, that’s right. I’m talking about driving website traffic from YouTube. Did you know that YouTube is considered to be the second largest search engine on the web? A staggering 85% of US internet audiences watch videos online. That’s insane, right? With those in mind, you really have no other option other than to embrace YouTube and video marketing to promote your website and to grow your online business in 2019. The image below was taken from a HubSpot Research and shows that in 2016 43% of audiences and customers wanted to see more videos. According to the Cisco Visual Networking Index (VNI) Forecast, 82 percent of all consumer Internet traffic will be by video by 2021. So, now that your brain is filled with video marketing stats and facts, it’s clearly time you took video marketing seriously. How do you maximize your potential for driving website traffic from YouTube? Well, asides from the plain obvious of having great content, of course, the other critical ingredient that is required is an active audience or community. And, how do you grow an audience on YouTube? Let’s take a look below. Let’s start with the most important ingredient of all, content. Growing an audience on YouTube is just the same as growing a readership for your blog or fanbase for your Facebook page. In other words, it all starts with great content. To grow your YouTube community, you have to have great content. So, for anyone to even be slightly interested in subscribing to your YouTube channel, they first got to fall in love with your content. If your content is trash, then you can forget about it. Your content has to be valuable, engaging, and memorable. A great way to start providing value through your YouTube channel is by creating insightful tutorials, and “How To” videos. “How To” videos, in fact, is one of the most searched for phrases on YouTube. People searching for ‘How To’ videos on YouTube is growing by 70% year on year! Many folks go to YouTube to find a solution to whatever problem they might be experiencing. So, where do you start with creating ‘how-to’ videos? 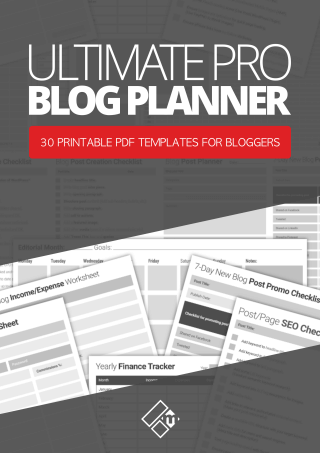 If you have a blog, then start with that! You probably already have a ton of awesome “how to” posts on your blog that you can use for your YouTube channel. All you have to do is repurpose the content and turn them into videos, and that’s exactly what I’ve been doing over on my YouTube channel for the most part of 2018. Just make a list of all the “how-to” blog posts you have that could be turned into cool videos, and create one each week. The next thing you want to do is to actually make your channel visually appealing. If you want your channel visitors to take you seriously and hit that subscribe button, you’ve got to look the part. Branding your YouTube channel can not only help you establish your identity but also let users instantly recognize your brand. Chances are you’re already using some kind of personal brand style for your blog or website, right? And, probably the same for your Social Media channels. So, naturally you would want to carry that branding over to your YouTube channel, it makes perfect sense to. Here’s a screenshot of my branded YouTube channel to give you some idea and inspiration of how to create a great looking cover art for your channel. Additionally, check out these other top YouTubers for more banner design inspiration. If you need help with creating a banner cover art for your YouTube channel, click this link. Recommended reading – 6 Amazing Tools for Creating Beautiful Visual Content. 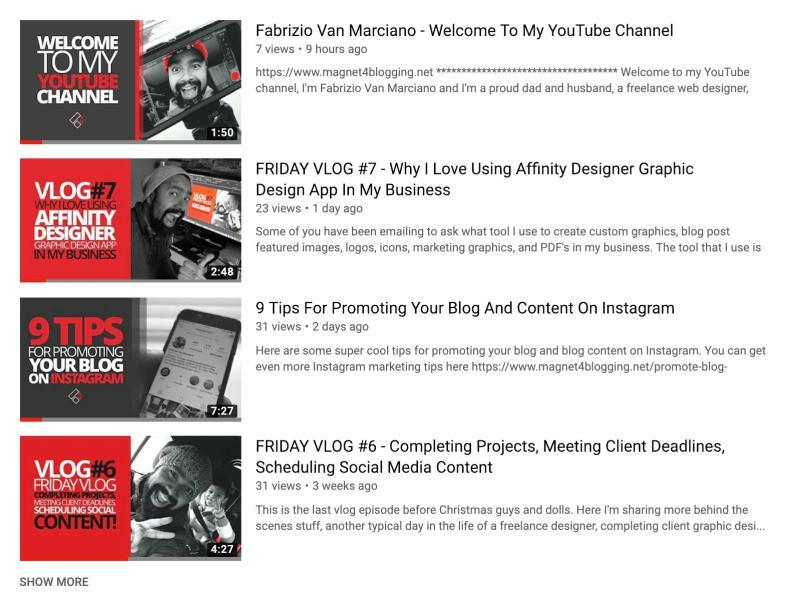 Design tips – Just to throw out some design tips – when creating your YouTube channel banner, think of the message you want to send to your viewers, let them know what your channel is all about. As well as creating a nice branded artwork for your channel, don’t forget to add custom URLs to your channel header too. 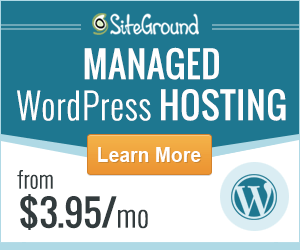 Such as your website address and links to other social channels. Bio – Make sure to write an interesting bio about who you are, what your cause is, and what your videos are essentially all about. Take a look at mine here to get some idea of what to write for yours, it’s not the most inspiring or interesting bio, I know, but it will give you an idea of what to come up with for your own channel bio. Remember to keep it short, sweet, and relevant. So, continuing on the topic of ‘branding’ to make your YouTube channel stand out and recognizable, don’t forget to add some cool customized thumbnails to your videos. I’ve always done this for all of my videos. Now, I realize that creating custom video thumbnails can take some time, but it’s so important if you want to make an impression on your potential subscribers. Before you run off to create some custom branded thumbnails for your videos, here are some design tips. Use high-quality, high-resolution images. You want your thumbnails to appear as crisp as possible, regardless of what screen size format your videos are being viewed on. Edit your images – Don’t use bland, boring stock images, make them interesting with your own personal touches. Use nice filters, maintain brightness, contrast etc. If you are using stock images to represent the content of your video, make sure they’re relevant and suitable for a wide audience. If you need assistance with creating custom thumbnail artwork for your YouTube videos, check out this link to see how I can help. Call to actions helps to promote engagement, so make sure you’re using them correctly. To add your call-to-action, you can use annotations, but personally, I find these to be quite annoying and intrusive for viewers. Instead, add your call-to-action messages while you’re editing your videos. You make them blend seamlessly into the content of your video, like the one below. 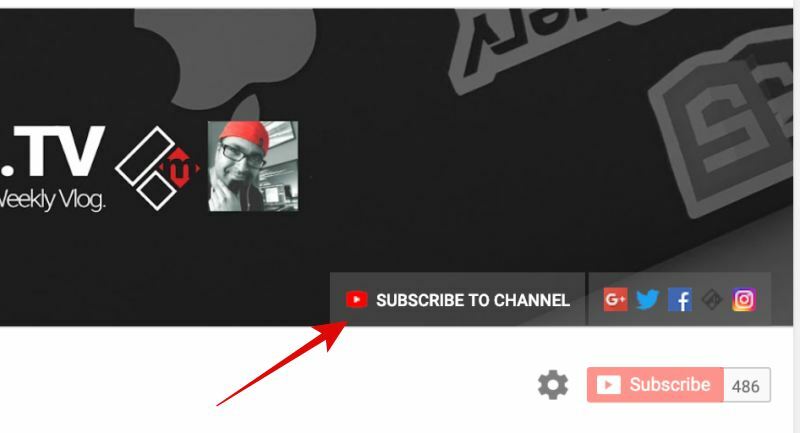 You already have a subscribe button placed on your YouTube channel for the public to view. What I like to do in addition to this is add my own custom link. Take a look at the screen capture image below, you’ll see that I’ve added an additional ‘link to subscribe’ using a custom link with the call-to-action text that says ‘Subscribe To Channel‘. 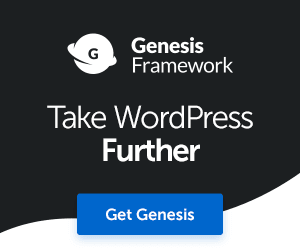 You can also experiment with different call-to-action messages, for example: Subscribe For Updates or Subscribe For More, or Join The Party, etc. Something I recently changed on my YouTube channel videos was the branded watermark logo. YouTube allows you to add a branded watermark to personalize or brand your channel videos. So I changed mine from my website logo to a “Subscribe” icon. 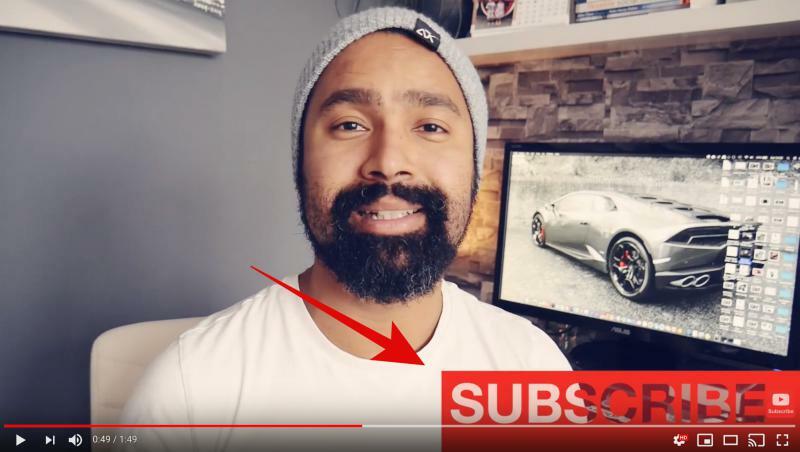 The purpose of your branded watermark is to get people to subscribe, well, what better way to do this than to use an actual “Subscribe watermark”? To do this, simply go to Creator Studio > Channel > Branding to change yours. YouTube allows you to connect your associated website to your YouTube channel. 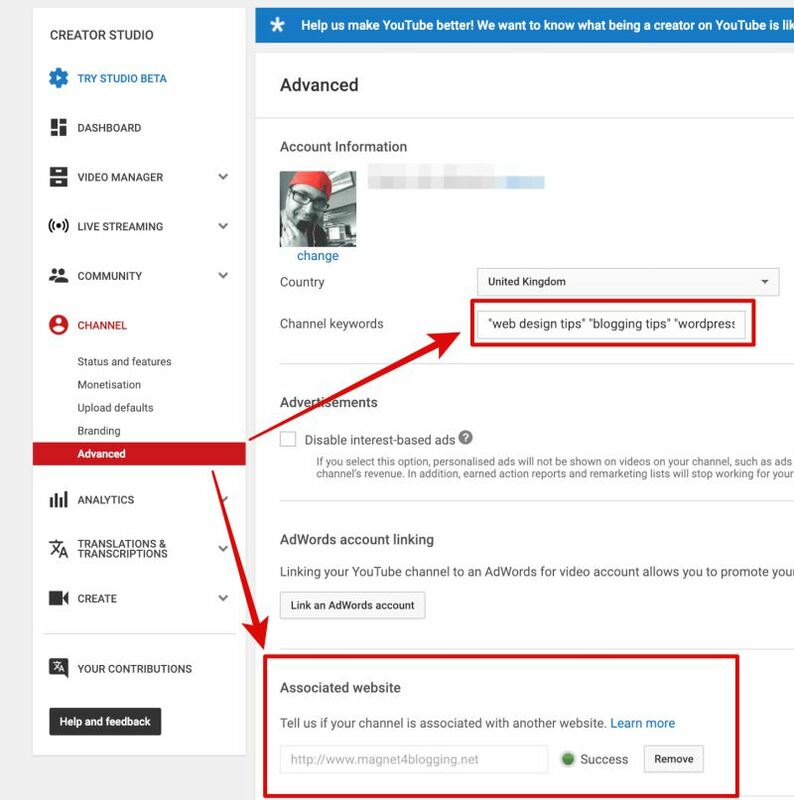 This helps to improve their search results and to also verify your channel as the official representation of your brand on YouTube. Simply go to your channel and hover your mouse over the navigational links section of your channel page. You can also add keywords related to your channel to improve the visibility of your channel in YouTube search. Probably the most effective way to grow your YouTube audience is by actively promoting actual videos around the web. When you create and upload a brand new video to your YouTube channel, asides from your subscribers, hardly anyone else will know about it? So, if you want to get as many views to your new videos as possible, and if you want to get as many peeps visiting your channel and hitting that subscribe button, you’ve got to do some marketing and promo work yourself. For starters, share your videos on all your other social networking sites, Facebook, Google+, LinkedIn, and Twitter. I know Facebook prefers to have its users upload video content directly to their platform rather than sharing a YouTube link, so perhaps you could create a short video for Facebook to promote your YouTube videos. Don’t forget to add a link to your video on YouTube. Share your videos in groups and communities around Facebook, Google+ and LinkedIn if you are allowed. Pin your videos to your Pinterest boards. Signup to Scoop.it and scoop your videos, and suggest your videos to other relevant topics on Scoop.it. Add videos to your presentations and upload to SlideShare. Link to your videos from your free reports, eBooks and PDFs, etc. You can do this by screen capturing the video, or use the thumbnail and hotlink the image to the respective video. 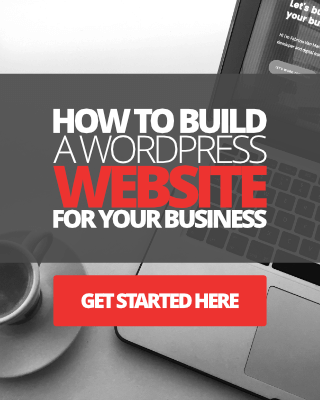 Create a dedicated custom video landing page on your blog like this one, and promote it like you would a blog post. Watch this tutorial video to learn how. Blog about your latest video (One of the best ways to drive traffic to new video content is to include it in a blog post). Add your videos to related articles on your blog. Link your channel to your Instagram bio. YouTube allows you to allocate a video to use as a welcome trailer for your channel. If you don’t have a trailer, then consider creating one. Click here to see how I can help you with this. Your welcome video doesn’t have to be long, just around 30 to 60 seconds long, however, it is a great opportunity for you to really let people know who you are, and what you’re passionate about, and how they can benefit from subscribing to your channel updates. For more information, tips, ideas, and examples of some cool welcome videos click here. You can also do a search on YouTube for “channel trailer” for some truly inspirational ideas of how other YouTubers have created their welcome videos. In addition, I welcome you to check out my YouTube channel trailer video below for some inspiration. 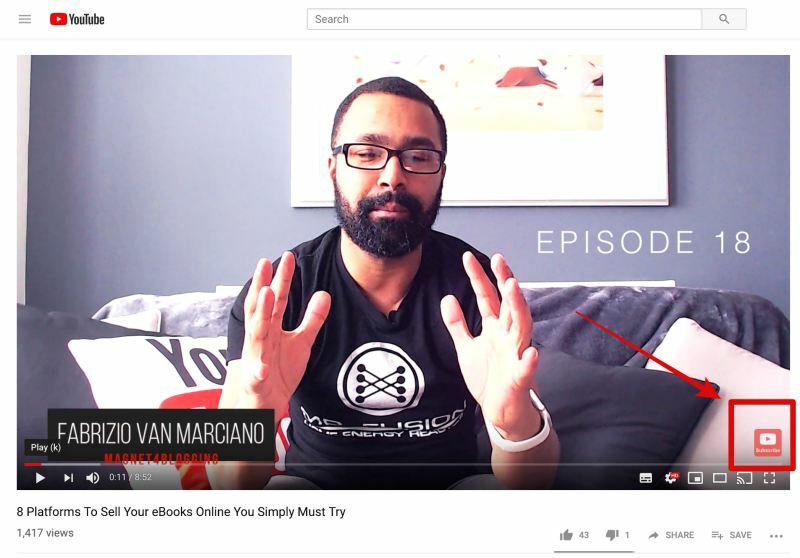 I appreciate just how important it is for you to grow your brand, and like I pointed out in tips #1 and #2, branding your channel and videos are critical elements for strengthening your brand on YouTube to help you grow your audience. That said, when it comes to video content marketing, remember that YOU are the face of your brand. Not a logo or some fancy looking banners, but YOU. If you’re a blogger or personal brand business owner creating tutorial videos or ‘talking head’ videos, again remember that you are the face of your brand always! That means you need to put yourself out there in front of your audience. Not always, but a lot of the times. Let your viewers see who you are. Don’t be shy. If you are shy, then videos and YouTube really isn’t for you. I know the process can be quite daunting at first, but trust me, it gets easier the more videos you do it, and it’s also fun too. Besides, showing your face can really help you connect with your audience on YouTube like nothing else. It will help you to build trust as well, now that’s important. In addition to showing your face, make sure you use your real name and not your business or company name. A quick note on your profile image. Make sure you use a real picture of yourself (your face), not your website or company logo. People like to feel as if they’re talking or listening to someone. Like I said, it will make them feel more connected to you. This is so, so, so, so, so important. It that enough so’s? Really, there’s nothing worse than watching a video that is of poor quality, but worst, that has really poor audio. From start to finish, shoot in HD or higher quality if possible. If you’re recording yourself and talking in your videos, you can use your Smartphone, you really don’t need any other expensive gear. However, I would invest in an external clip-on microphone to improve the audio quality. If you are on a budget and want to record directly into your laptop or computer, and don’t want to use your Smartphone, I recommend the Logitech C920 HD USB Cam. You can find this cam here on Amazon. If you’re creating screencasts, record the full screen and not just a small area of your screen. You can use Screencast-O-Matic for your screen tutorials. Again, use an external mic, something like the Snowball iCE Condenser USB Mic would be perfect. You can find this on Amazon here. For my vlogs and talking head videos, I currently use the Panasonic Lumix G7 with a Rode Shotgun Mic. See my setup below. My Kit: If you’re interested in checking out my vlogging and video recording gear, check out this page. Finally, and this one should go without saying. 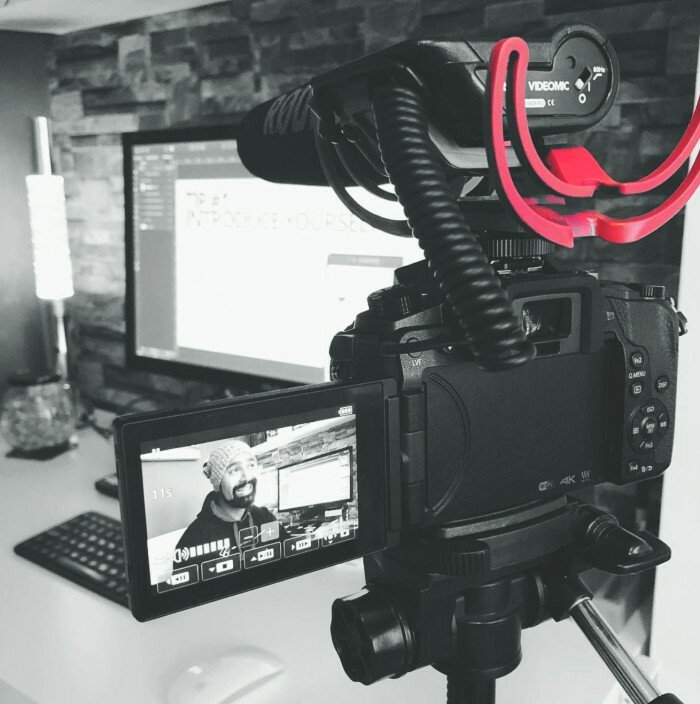 If you’re going to spend time crafting awesome videos, make sure that you spend some time making them watchable, by editing them correctly before sharing them with your audience. YouTube has some awesome built-in tools to help you format your videos, but you can also use your own software should you wish. If you’re a PC user, Windows Movie Maker will do fine if that even still exists. If you’re a Mac user like me, iMovie will do just fine. Filmora is also a great app/tool for making your videos look and feel professional. So that might be worth a try. I’ve recently shifted from using iMovie to Final Cut Pro X for editing my videos, and it works just perfect for me. You obviously don’t need expensive video editing software, you can make use of whatever quality app or tool you have available to polish your videos. So, as you can see, growing your YouTube audience doesn’t just mean doing some marketing and promotional work. It starts with creating the best content that you can possibly create for your intended audience. Really create as much awesome value as you can. Marketing and promotion, of course, plays a huge role if you really want to grow your YouTube audience. It does take time, though, so don’t be in such a rush. Psst, if you want to follow me on YouTube to get tips on website design, WordPress hacks, product reviews, digital marketing, and blogging tips, and productivity hacks, you can subscribe to my YouTube channel here. I think that some of these tips will contribute to increasing your YouTube audience, but I’m not sure how well they would contribute to the speed in growth. Optimising your YouTube channel (all points except #6) is essential in setting the foundations. I have always found that growing your YouTube audience relies more on your promotional activities. I see it the same with blogging – you can have the best designed blog and most compelling content in the world, but if you don’t promote it and no one knows about it, it will never create value. Hi Stuart, thanks for your great comment, very true. Promotion is equally as important, couldn’t agree with you more on that. Not all of these tactics will get you more subscribers over night I appreciate that, however let’s take creating a channel trailer for example, that strategy alone if done right, has the potential to help entice more viewers to take action and subscribe a lot quicker than most other methods, especially when combined with your video content promotional activities. Have an awesome week Stuart, always great to see you here. Hey Fabrizio, I really enjoyed reading all the tips you mentioned, I’m seriously thinking about making a compelling trailer for my channel too. Thanks again for this list.